Overview: Undelete for Android is an application for root users that allows you to recover any type of deleted file from your SD card or internal storage. 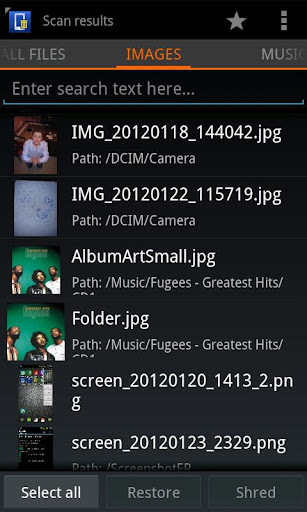 With support for over 1000 file types, Undelete can come in handy if you accidentally delete photos or want some old tunes to listen to on the go. Undelete can also securely wipe and shred files so that they will be impossible for others to recover. Without the unlock Key, this application will only restore image files. Please buy the Key to unlock full functionality. Currently, only FAT is supported. On most devices this means that only the external SD is supported. Some files that are discovered after a scan may fail to recover as the data can be corrupted beyond repair, just like desktop based solutions.